Hematite beads are formed from hematite or "bloodstone." Most people wear hematite beads for decoration, and many claim the beads help relieve aches and pains. Hematite beads are heavy, smooth and cool to the touch. Hematite beads have a variant color of silver, black and gray, with a metallic to dull luster. Hematite beads are used for bracelets, necklaces and earrings. Hematite beads are formed from the minerals of iron oxide and may contain small amounts of titanium. Most hematite is mined in South America, Europe and North America for its quality. Hematite beads may be purchased to create jewelry. Hematite beads are popular for their aesthetic and believed healing properties. Hematite beads are paramagnetic, and it is believed that hematite's magnetic properties reduce pain. 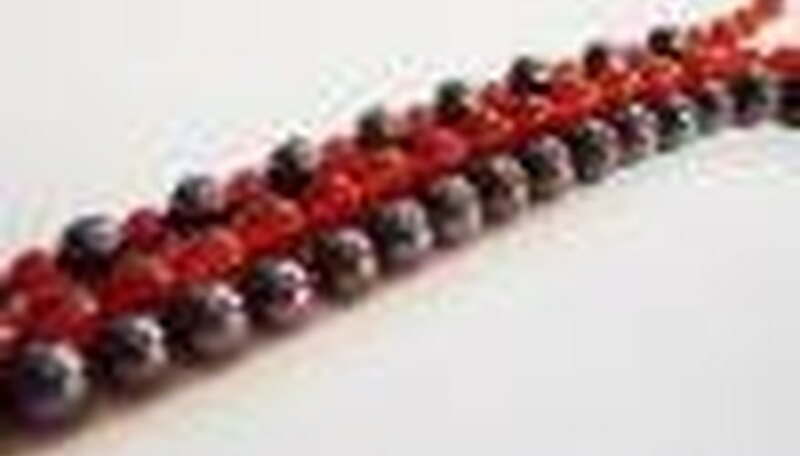 Hematite beads are worn with the premise that positively charged ions in the blood are accelerated. As the charged ions pass through a magnetic field, the friction creates heat and increases blood flow. Paramagnetic or magnetic jewelry should not be worn by those who have pacemakers, defibrillator pumps or insulin pumps. It is also not advised for women who are pregnant, without first seeking the advise of a physician.